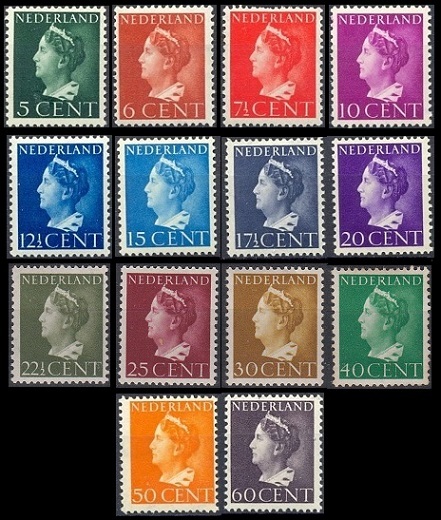 Definitive Netherlands stamps, first issued in 1926, were retired at the end of 1939, and they were replaced by a more modernistic design with a more contemporary portrait of Queen Wilhelmina. 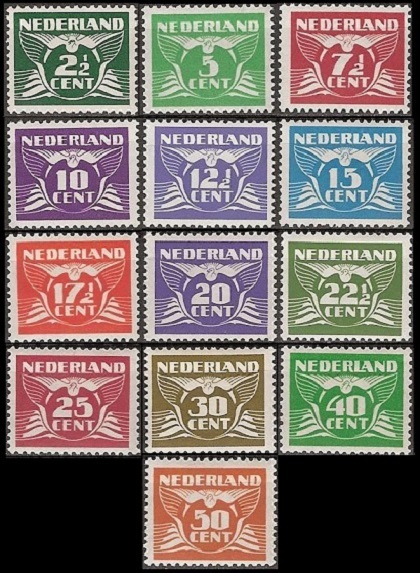 The fourteen definitive stamps shown above were issued in 1940 and again, after the liberation of the Netherlands from German occupation, in 1946 and 1947. The stamps are photogravure, perforated 13 1/2 x 12 3/4, and they are watermarked circles. 05 C. (1940 - NVPH #332, Sc. #216) - Dark Green. 07 1/2 C. (1940 - NVPH #334, Sc. #217) - Red. 10 C. (1940 - NVPH #335, Sc. #218) - Red Violet. 12 1/2 C. (1940 - NVPH #336, Sc. #219) - Dark Blue. 15 C. (1940 - NVPH #337, Sc. #220) - Light Blue. 20 C. (1940 - NVPH #339, Sc. #221) - Violet. 22 1/2 C. (1940 - NVPH #340, Sc. #222) - Olive Green. 25 C. (1940 - NVPH #341, Sc. #223) - Red Brown. 30 C. (1940 - NVPH #342, Sc. #224) - Brown. 40 C. (1940 - NVPH #343, Sc. #225) - Green. 06 C. (1947 - NVPH #333, Sc. #216B) - Red Brown. 17 1/2 C. (1946 - NVPH #338, Sc. #220B) - Slate. 50 C. (1946 - NVPH #344, Sc. #225A) - Orange. 60 C. (1946 - NVPH #345, Sc. #225B) - Dark Violet. 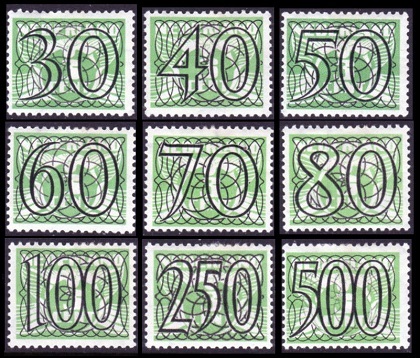 Imperforate examples of the 5 C., 10 C., 12 1/2 C., and 15 C. denominations were sold through German philatelic channels during the occupation. Today, these stamps are practically worthless. The 2012 Scott catalog prices the set of four stamps at US $1.00. The 2001 NVPH catalog prices the set at NL 10.00 Gulden or about US $4.00. Germany invaded the Netherlands in May 1940 and established an occupation government there. The country was then ruled by a German-appointed governor and the Dutch National Socialist Party. During the invasion, the Dutch royal family and the heads-of-government escaped to Great Britain, where they formed a government-in-exile. Of course, the German occupation of the Netherlands required that new definitive postage stamps be issued without the portrait of a monarch. In the short run, provisional definitive postage stamps were created by overprinting and re-valuing the 3 C. denomination gull and numeral definitive stamp type of 1924-1926. These provisional stamps are shown below. The eighteen (German occupation) provisional Netherlands stamps shown above were issued during October 1940. 02 1/2 C. (1940 - NVPH #356, Sc. #226) - Brick Red. 05 C. (1940 - NVPH #357, Sc. #227) - Green. 07 1/2 C. (1940 - NVPH #358, Sc. #228) - Brick Red. 10 C. (1940 - NVPH #359, Sc. #229) - Green. 12 1/2 C. (1940 - NVPH #360, Sc. #230) - Light Blue. 17 1/2 C. (1940 - NVPH #361, Sc. #231) - Green. 20 C. (1940 - NVPH #362, Sc. #232) - Green. 22 1/2 C. (1940 - NVPH #363, Sc. #233) - Green. 25 C. (1940 - NVPH #364, Sc. #234) - Green. 30 C. (1940 - NVPH #365, Sc. #235) - Green. 40 C. (1940 - NVPH #366, Sc. #236) - Green. 50 C. (1940 - NVPH #367, Sc. #237) - Green. 60 C. (1940 - NVPH #368, Sc. #238) - Green. 70 C. (1940 - NVPH #369, Sc. #239) - Green. 80 C. (1940 - NVPH #370, Sc. #240) - Green. 100 C. (1940 - NVPH #371, Sc. #241) - Green. 250 C. (1940 - NVPH #372, Sc. #242) - Green. 500 C. (1940 - NVPH #373, Sc. #243) - Green. The 2 1/2 C. and 07 1/2 C. denomination provisional stamps were also issued in coil-format, with the rolls containing both denominations. As a result, se-tenant combinations of these two denominations exist, some of them very valuable. During 1941, the German occupation government re-issued the dove and numeral definitive stamp designs of 1926 in new colors and denominations. These thirteen new definitive Netherlands stamps are shown above. 02 1/2 C. (1941 - NVPH #379, Sc. #243A) - Brick Red. 05 C. (1941 - NVPH #380, Sc. #243C) - Light Green. 07 1/2 C. (1941 - NVPH #381, Sc. #243E) - Red. 10 C. (1941 - NVPH #382, Sc. #243G) - Violet. 12 1/2 C. (1941 - NVPH #383, Sc. #243H) - Light Ultramarine. 15 C. (1941 - NVPH #384, Sc. #243J) - Light Blue. 17 1/2 C. (1941 - NVPH #385, Sc. #243K) - Orange. 20 C. (1941 - NVPH #386, Sc. #243L) - Violet. 22 1/2 C. (1941 - NVPH #387, Sc. #243M) - Dark Olive Green. 25 C. (1941 - NVPH #388, Sc. #243N) - Lake. 30 C. (1941 - NVPH #389, Sc. #243O) - Olive Green. 40 C. (1941 - NVPH #390, Sc. #243P) - Emerald Green. 50 C. (1941 - NVPH #391, Sc. #243Q) - Tan. The 2 1/2 C. and 07 1/2 C. denomination stamps were also issued in coil-format, with the rolls containing both denominations. As a result, se-tenant combinations of these two denominations exist. Some of the German occupation stamps of 1940 and 1941 were also issued in booklets. Complete booklets are rare. This change in government required the issue of new definitive Netherlands stamps, featuring the portrait of Queen Wilhelmina. 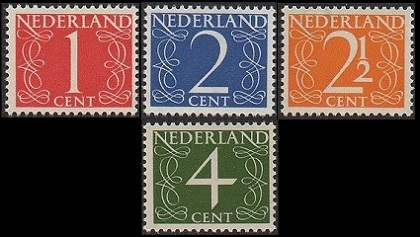 The four high-denomination definitive Netherlands stamps shown above, featuring the design of the 1940 definitive stamps of Queen Wilhelmina, were issued during 1946. These new stamps are engraved, perforated 13 1/2 x 14, and unwatermarked. 01 G. (1946 - NVPH #346, Sc. #278) - Grayish Blue. 02 1/2 G. (1946 - NVPH #347, Sc. #279) - Red Brown. 05 G. (1946 - NVPH #348, Sc. #280) - Green. 10 G. (1946 - NVPH #349, Sc. #281) - Dark Violet. 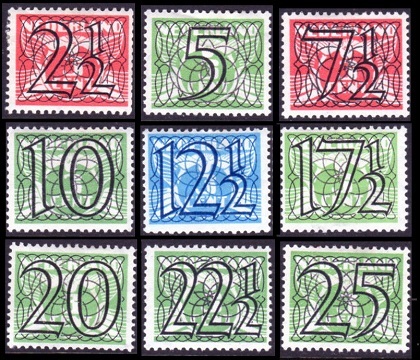 The four low-denomination definitive Netherlands stamps shown above were issued in 1946 and 1947 to replace the low-denomination dove and numeral types that had previously been in use since 1924. 01 C. (1946 - NVPH #460, Sc. #282) - Red. 02 C. (1946 - NVPH #461, Sc. #283) - Blue. 2 1/2 C. (1947 - NVPH #462, Sc. #284) - Yellow Orange. 04 C. (1946 - NVPH #464, Sc. #285) - Olive Green. The 1 C. denomination was re-issued on phosphor paper in 1969 (NVPH #PB-8), and the 4 C. denomination was re-issued on phosphor paper in 1962 (NVPH #774). The 2 C. denomination was issued in coil-format in 1972, with a control number printed on the back of every fifth stamp. 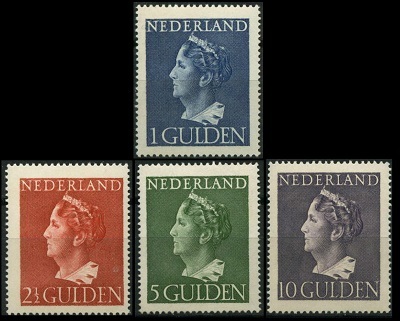 The fifteen definitive Netherlands stamps shown above, featuring a new portrait of Queen Wilhelmina, were issued in 1947 and 1948. 05 C. (1948 - NVPH #474, Sc. #286) - Yellow Green. 06 C. (1947 - NVPH #475, Sc. #287) - Brown Black. 06 C. (1948 - NVPH #476, Sc. #301) - Grayish Blue (Not shown above). 07 1/2 C. (1948 - NVPH #477, Sc. #288) - Red Brown. 10 C. (1947 - NVPH #478, Sc. #289) - Violet. 12 1/2 C. (1948 - NVPH #479, Sc. #290) - Red. 15 C. (1947 - NVPH #480, Sc. #291) - Purple. 20 C. (1947 - NVPH #481, Sc. #292) - Dark Blue. 22 1/2 C. (1948 - NVPH #482, Sc. #293) - Sepia. 25 C. (1947 - NVPH #483, Sc. #294) - Light Blue. 30 C. (1947 - NVPH #484, Sc. #295) - Orange. 35 C. (1947 - NVPH #485, Sc. #296) - Bluish Green. 40 C. (1947 - NVPH #486, Sc. #297) - Red Brown. 45 C. (1948 - NVPH #487, Sc. #298) - Blue. 50 C. (1948 - NVPH #488, Sc. #299) - Light Brown. 60 C. (1948 - NVPH #489, Sc. #300) - Orange Red. 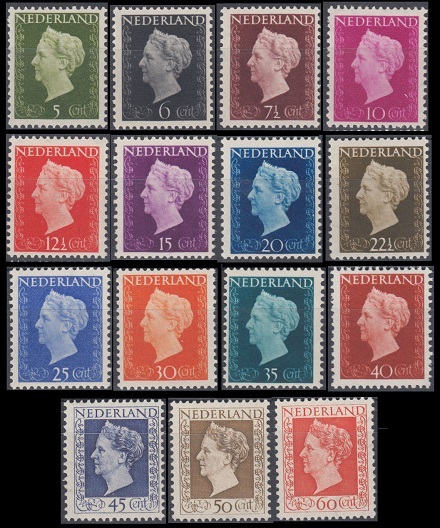 These new definitive Netherlands stamps were only in use a very short time before the end of the reign of Queen Wilhelmina. As a result, many of the denominations are very scarce, especially in mint condition.